I’ve been a bit on a Red Velvet kick because I love it so much! LOL Either way, I wanted to make Red, White, & Blue versions of these for the fourth of July, but I ended up having so much to do that they got pushed to the wayside. I was going to make the icing blue using Kool-aid, how fun would that have been? Grab two bowls. In the first, combine all of the dry ingredients EXCEPT the sugar. In the other bowl, cream together the butter and the sugar. Then add the eggs ONE AT A TIME and the rest of the wet ingredients. Mix thoroughly. Next, slowly add the dry ingredients to the wet ingredients. I do it about 1/3 at a time. Add some, mix, then add some more. Once it’s all nice and combined, using a teaspoon, spoon even amounts onto a greased cookie sheet. Bake in the oven for 10 mins. Take out and cool COMPLETELY on a cooling rack. Combine the above ingredients and then spoon onto a cookie sheet. Bake for 10-12 mins, allow to cool completely! 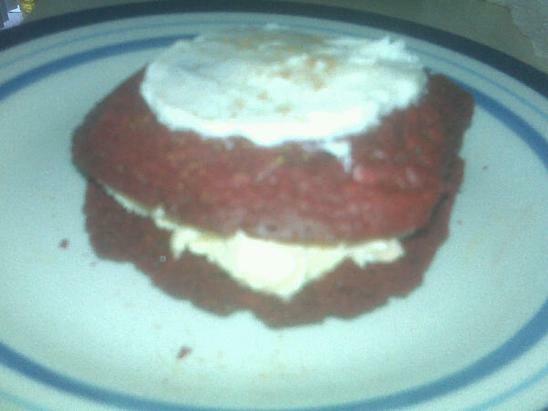 For the sandwiches top the TOP cookie with some cream cheese icing (just buy it lol). You can add chopped pecans as well. 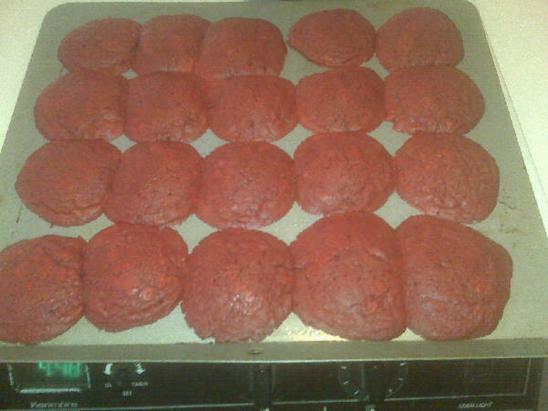 Using a soft ice cream, spoon some onto the bottom cookie once they have cooled completely and hardened a bit. All done! Place the remaining sandwiches in the freezer, or make them as you want them. I have never eaten red velvet cake…it is near to impossible to find in Canada. I am soooo trying this recipe. i loooove red velvet cake (i have it every year for my bday), so to combine it w/icecream my other love is going to be awesome! OOOH red velvet cake is the only cake I will touch. (Unless it’s those generic microwave cakes.) I wanna try this recipe!! !